In Mexico City, thousands of students marched the streets in opposition to the election of Enrique Peña Nieto. They marched through the rain and the dark holding banners and chanting. The movement is called Yo Soy 132 – Spanish for “I am 132.” It is a pronouncement of solidarity that originated with the protest’s initiators. Later that year, the Cambridge University student newspaper, The Tab, broke a story about their institution’s email accounts getting invaded by hacktivist group, Nullcrew. 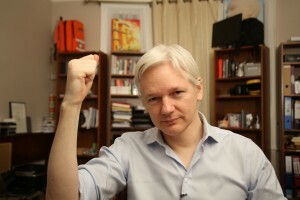 They published these private details online along with the hash tags “#OpFreeAssange,” “#FuckThePolice,” and the saying “My weapon is my voice. Time to raise yours.” They stated that their actions were in an attempt to prove that “nothing is secure.” Similar events occured at Yale and Oxford around the same time. Six months later, Sydney University students and teachers formed picket lines at the entrances to their campus. They locked arms with members of educational unions. They shouted in opposition to reductions of staff by the university’s administration and cried out against the government’s cuts to tertiary education. This ‘education revolution’ came to a head last week, when troops of riot police retaliated and students were injured. Directly or indirectly, Julian Assange influenced these protests. He is the controversial founder of the WikiLeaks organisation and has been instrumental in changing the way the world thinks about privacy and institutional opposition. “I think that it’s important, that even when you know you aren’t going to win the battle, to show some kind of resistance… you’re not only setting a specific deterrent in relation to that issue, you’re also creating a general signal.” Assange spoke to me through a muffled phone line with a disconcerting echo. He told me it was because of a lot of poor quality phone interception. It was midnight in London and, although he is often described as one of the most revolutionary individuals of our generation, he sounded tired and croaky. The interview started off awkwardly. For some reason, he started by asking for an introduction: “First of all, can you tell me a little bit about yourself? How did you come to this position and why are you in it?” He asked me if I thought the word “journalist” had been used a bit loosely in the past few years. Julian Assange was showing interest in me and my life in true politician style. Our conversation was on the eve of one of the USyd strikes. A number of protests of this kind had been organised in the semester and they were reminiscent of rallies from the sixties and seventies. As a public figure giving the term ‘direct action’ a completely new meaning, I was interested to know if Assange thought the tactics used by USyd students were archaic and old fashioned. “I think that’s because the institutional memory of protest is largely embedded in left-wing groups, like the various socialist parties, and they haven’t changed much in the last thirty years – put it that way,” he says. For Julian Assange, his university life was very different to most. His first involvement with university was via hacking – “in my early twenties, I was inside universities all around the world.” But the more traditional university experience he had was studying a Bachelor of Science degree in physics and pure mathematics at the University of Melbourne. It’s reassuring to know that even Julian Assange received pass grades in most of his subjects, but he dropped out of his degree after discovering a very perturbing connection between the Melbourne University Mathematics Department and the United States Defence System. “There was an oversupply of intellectual research… and a lack of political will to take the fruits of our intellectual labors and apply them,” Assange told me. This experience paved the way to starting WikiLeaks. Nevertheless, the headlines and the front page articles about Julian Assange are nowhere to be found as he approaches ten months locked up in the Ecuadorian embassy in London. When I asked him why he was so afraid of being extradited, especially when he knew that the majority of the world would be on his side, he very simply answered “I don’t believe in becoming a martyr. The most effective activist is one who can work… I don’t want to downplay the difficulties [of living in the embassy], but the US and its allies who are using the rule of law in order to crack down on WikiLeaks have placed me into a situation where I have nothing else to do but work. I think the maneuver has backfired a little.” Julian Assange was so optimistic that he came across as delusional. This war that he has so nobly started is definitely not as strong as it was a year ago, but that’s not to say that this is the end. Protest movements around the world continue to be influenced by the actions of Assange and WikiLeaks. Whether or not all of this “work” that he is doing stuck inside a lifeless embassy will amount to landmark changes, is as unpredictable as his next move.